Authority: The Independence Advisory Council is authorized under section 3207 of the Affordable Care Act, Public Law 111-148. The Council is governed by provisions of Public Law 92-463, as amended, (5 U.S.C. App. 2), which sets forth standards for the formation and use of advisory committees. SUMMARY: The U.S. Department of Health and Human Services announces establishment of the Independence Advisory Council, as directed by section 3207 of Public Law 111-148. FOR FURTHER INFORMATION CONTACT: Sue McElheny, U.S. Department of Health and Human Services; Tel (202) 357-3521, Fax (202) 357-3467, classprogram@hhs.gov. SUPPLEMENTARY INFORMATION: Under the Affordable Care Act, Public Law 111-148, the President directed that the Council shall be established within the Department of Health and Human Services (HHS). To comply with the authorizing directive and guidelines under the Federal Advisory Committee Act (FACA), a charter has been filed with the Committee Management Secretariat in the General Services Administration (GSA), the appropriate committees in the Senate and U.S. House of Representatives, and the Library of Congress to establish the Council as a non-discretionary Federal advisory committee. The Secretary signed the charter on November 9, 2010. The charter was filed on November 9, 2010. Objectives and Scope of Activities. 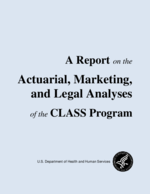 The CLASS Independence Advisory Council is the Department's statutory public advisory body on matters of general policy in the administration of the CLASS program in the Affordable Care Act. The Council will provide the Secretary of Health and Human Services with advice and guidance on the development of the CLASS Independence Benefit Plan, the determination of monthly premiums under such plan, and the financial solvency of the program. In these matters, the Council shall consult with all components of the Department, other federal entities, and non-federal organizations, as appropriate; and examine relevant data sources. Membership and Designation. The CLASS Independence Advisory Council shall consist of not more than 15 individuals, not otherwise in the employ of the United States who shall be appointed by the President without regard to the civil service laws and regulations; and a majority of whom shall be representatives of individuals who participate or are likely to participate in the CLASS program, and shall include representatives of older and younger workers, individuals with disabilities, family caregivers of individuals who require services and supports to maintain their independence at home or in another residential setting of their choice in the community, individuals with expertise in long-term care or disability insurance, actuarial science, economics, and other relevant disciplines, as determined by the Secretary. The members of the CLASS Independence Advisory Council shall serve overlapping terms of 3 years (unless appointed to fill a vacancy occurring prior to the expiration of a term, in which case the individual shall serve for the remainder of the term). A member shall not be eligible to serve for more than 2 consecutive terms. The President shall, from time to time, appoint one of the members of the CLASS Independence Advisory Council to serve as the Chair. All members will serve as special government employees. All members, while so serving away from their homes or regular places of business, may be allowed travel expenses, including per diem in lieu of subsistence, in the same manner as such expenses are authorized by Section 5703, Title 5, U.S. Code, for employees serving intermittently. Nominations shall be submitted to U.S. Department of Health and Human Services, c/o Administration on Aging, Attn: Class Nominations, Washington, DC, 20201 (or) classprogram@hhs.gov (or) fax (202) 357-3467 no later than December 1, 2010. Administrative Management and Support. HHS will provide funding and administrative support for the Council to the extent permitted by law within existing appropriations. Staff will be assigned to a program office established to support the activities of the Council. Management and oversight for support services provided to the Council will be the responsibility of the CLASS Office. All executive departments and agencies and all entities within the Executive Office of the President shall provide information and assistance to the Council as the Chair may request for purposes of carrying out the Council's functions, to the extent permitted by law. A copy of the Council charter can be obtained from the designated contacts or by accessing the FACA database that is maintained by the GSA Committee Management Secretariat. The Web site for the FACA database is http://fido.gov/facadatabase/.